The aim of the study was to evaluate the efficacy of ondansetron during spinal anesthesia for cesarean section in overcoming the associated nausea, vomiting, bradycardia, and hypotension. Ondansetron, a widely used antiemetic and serotonin antagonist, has been safely used to blunt the Bezold–Jarisch reflex, resulting in less bradycardia and hypotension in humans undergoing spinal anesthesia. One hundred parturients scheduled for elective cesarean section were randomly allocated into two groups. Before induction of spinal anesthesia group I (n = 50) received intravenous ondansetron 4 mg and group II (n = 50) received normal saline. Blood pressure, heart rate (HR), nausea and vomiting, shivering, vasopressor requirements, and Apgar score at 1 and 5 min were assessed. Decreases in systolic arterial pressure were significantly lower in group I than in group II. Patients in group I had significantly less requirement for vasopressor (P = 0.005), needed lower dose of vasopressor (P = 0.01), and had significantly lower incidences of nausea and vomiting (P = 0.03). Decreases in HR were significantly lower in group I than in group II just after spinal anesthesia (P = 0.02), at 20 min (P = 0.01), and 50 min (P = 0.02). Decreases in mean blood pressure were significantly lower in group I than in group II just after spinal anesthesia (P = 0.007). In parturient women undergoing elective cesarean section, intravenous 4 mg ondansetron significantly decreased the hypotension, HR fluctuation, and vasopressor doses used. Spinal anesthesia has been shown to be an easy, rapid, and safe technique for cesarean section. Nevertheless, it has some side effects; most common among these side effects are hypotension, bradycardia, intraoperative nausea and vomiting in more than 66% of patients . Hypotension after spinal anesthesia is initially due to a blockade of sympathetic fibers leading to a drop in systemic vascular resistance. Maternal symptoms of low blood pressure (BP) include nausea, vomiting, dizziness, and decreased consciousness . Spinal-induced bradycardia is multifactorial but is in part due to the Bezold–Jarisch reflex. This reflex is mediated by serotonin receptors within the wall of the ventricle in response to systemic hypotension . It is thought that the stimulation of these peripheral 5-hydroxytryptamine subtype 3 (5-HT3) receptors results in increased parasympathetic activity and decreased sympathetic activity, resulting in bradycardia, vasodilatation, and hypotension . Ondansetron is one of the new classes of 5-HT3 receptor antagonists. Ondansetron, a widely used antiemetic and serotonin antagonist, has been safely used to blunt the Bezold–Jarisch reflex, resulting in less bradycardia and hypotension in humans undergoing spinal anesthesia . Ondansetron has been demonstrated to be an effective and well-tolerated drug for the prevention and treatment of nausea and vomiting. Patients were randomized (during preanesthetic consultation) to one of two groups using a random sequence: group I received 4 mg ondansetron in 10 ml saline intravenously 5 min before spinal puncture and group II received 10 ml of saline in the same way and at the same timing. Each group included 50 patients. In the preanesthetic room women received 500 ml lactated Ringer's solution that was given over 30 min. In the operating room baseline values of pulse oximetry, noninvasive BP, and ECG were recorded. The spinal technique was performed with the patient in the sitting position at L3–L4 or L4–L5 with 2 ml hyperbaric bupivacaine 5 mg/ml, which was administered after confirmation of cerebrospinal fluid free flow without barbotage through a 25-G spinal needle. The patients were immediately placed in the supine position with 15° left tilt, and the sensory block was assessed according to loss of pinprick sensation (25-G hypodermic needle) every 5 min for 15 min, beyond which parturients were excluded if the sensory level was below T6. Surgery started as soon as the T6 dermatome was anesthetized; patients who failed to reach at least this level were excluded from the study, and general anesthesia was then administered at the attending anesthesiologist's discretion. The women were given 1000 ml Ringer's lactate throughout the surgery. Hemodynamic parameters was measured and recorded before spinal anesthesia administration, just after spinal anesthesia, and at 10-min intervals until the end of surgery and at the first and second hour after surgery. 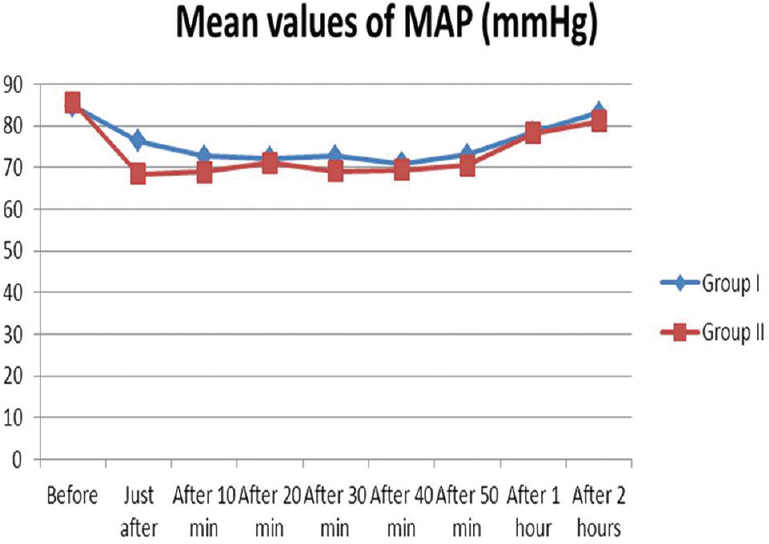 Hypotension, defined as a decrease from baseline values of 20% or more in systolic arterial pressure less than 80 mmHg, was treated with ephedrine bolus (6 mg) until restoration of baseline values. Bradycardia was defined as a 30% drop in heart rate (HR) or up to 45 beats per min. We took note of the total dose of ephedrine needed. Episodes of nausea, vomiting, and shivering were recorded. Neonatal Apgar scores were routinely determined at 1 and 5 min after delivery. The method of sampling used in the study was simple random sampling. The method of selection was the ideal bowl method. We made a frame and used 100 paper cards. Each of these papers had a serial number taken from the frame. All the papers were similar in every respect, folded in the same manner and put in the ideal bowl, and thoroughly mixed before selection. Selection was done without replacement. Double-blinded study means that the drug was prepared by one set of anesthesiologists and given by another one and neither the patient nor the doctor was aware of the type of drug given. The sample size calculation assumed that the expected percentage of vomiting in group I (ondansetron) would be 0.0% and that in group II (controls) would be 23.33% . To achieve 90% power to detect this difference with a significance level of 2.5% it was estimated that 41 participants would be required per group. With a withdrawal/nonevaluable subject rate of 20%, a total of 50 participants per group were recruited, leading to a total sample size of 100 participants. Data were statistically described in terms of range, mean ± SD, median, frequencies, and percentages when appropriate. Comparison of quantitative variables between the study groups was done using the Student t-test for independent samples. For comparing categorical data, the c2- test was performed. Fisher's exact P test was used when the expected frequency was less than 5. A P value less than 0.05 was considered statistically significant. All statistical calculations were performed using computer programs. The mean age was 26.5 years, the mean BMI was 31.8 kg/cm 2, the mean gestational age was 38.65 weeks, and the meanorder of pregnancy was 2.15. 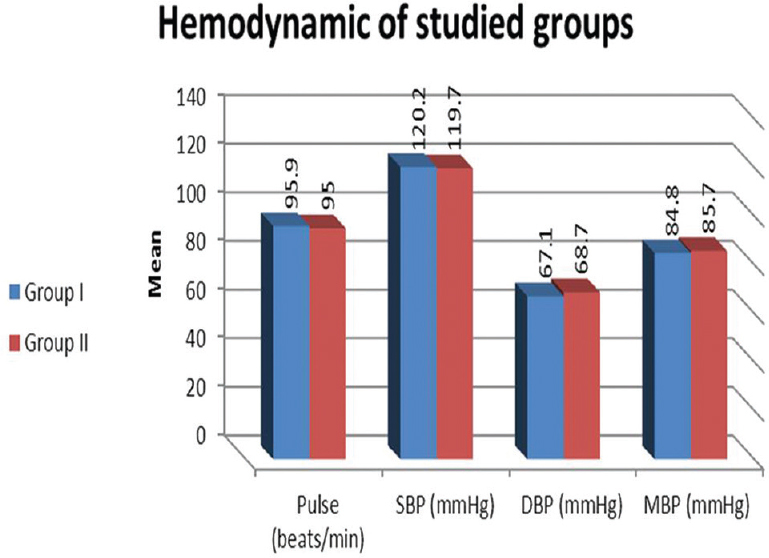 There was no statistically significant difference between the two groups as regards diastolic blood pressure (DBP), mean blood pressure (MBP), and mean pulse rate before spinal anesthesia [Table 1] and [Figure 1]. Figure 1: Hemodynamic of the studied groups before spinal anesthesia. DBP, diastolic blood pressure; MBP, mean blood pressure; SBP, systolic blood pressure. There was no statistically significant difference between the two groups as regards the mean HR before spinal anesthesia and 10, 30, 40 min and 1 and 2 h after induction. But there were statistically significant differences between the two groups as regards the mean pulse rate just after spinal anesthesia (P = 0.02), after 20 min (P = 0.01), and after 50 min (P = 0.02). 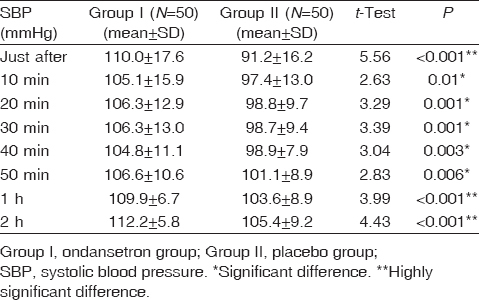 Systolic blood pressure (SBP) measurements were significantly decreased in group II when compared with group I [Table 2] and [Figure 2]. 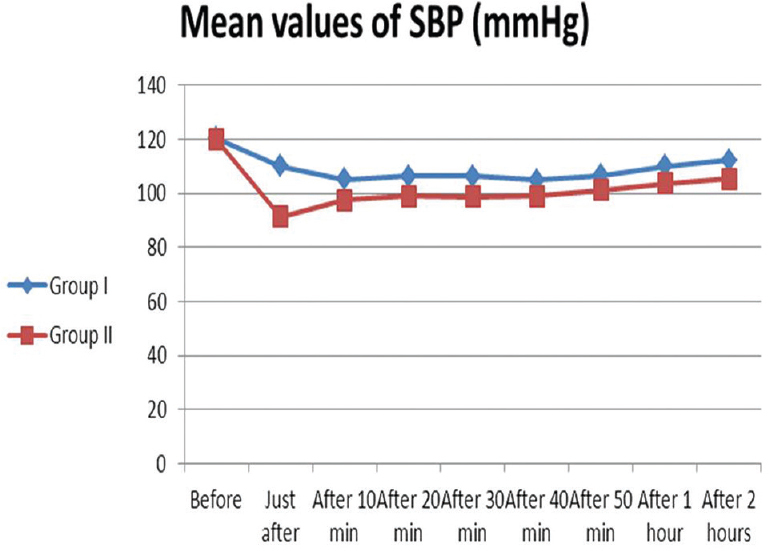 Figure 2: Systolic blood pressure (SBP) of the studied groups after spinal anesthesia. There were no statistically significant differences between the two groups as regards the MBP after 10, 20, 30, 40, 50 min and 1 and 2 h, respectively. However, there was a statistically significant difference between the two groups just after spinal anesthesia [Table 3] and [Figure 3]. Figure 3: Mean arterial pressure (MAP) of the studied groups after spinal anesthesia. There was a statistically significant difference between the two groups as regards the need for vasopressor. 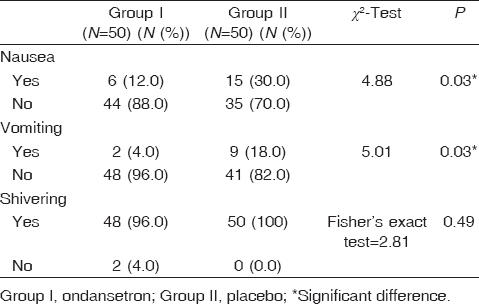 The need for vasopressor was significantly lower in group I than in group II (30 vs. 70%, respectively); meanwhile the need for no vasopressor was significantly higher in group I than in group II (58 vs. 42%, respectively) [Table 4] and [Figure 4]. There was a statistically significant difference between the two groups as regards the dose of vasopressor required. 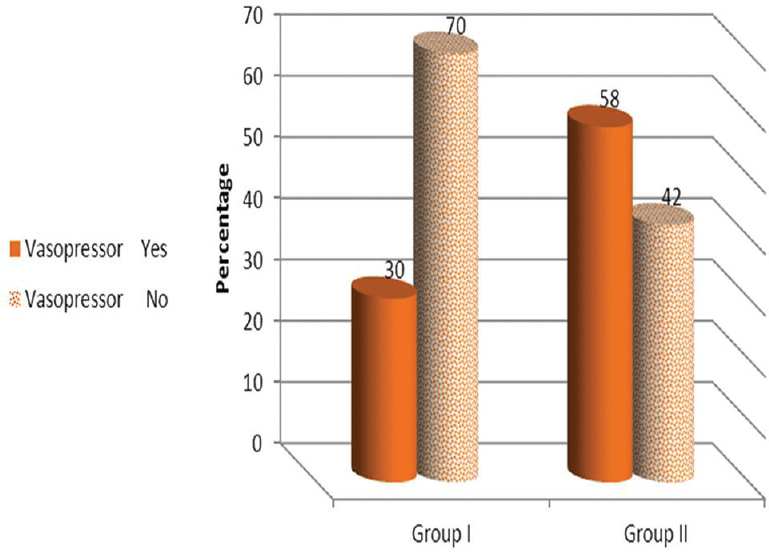 Figure 4: Vasopressor need in the studied groups. There was a statistically significant difference between the two groups as regards nausea and vomiting. However, there was no statistically significant difference as regards shivering [Table 5] and [Figure 5]. 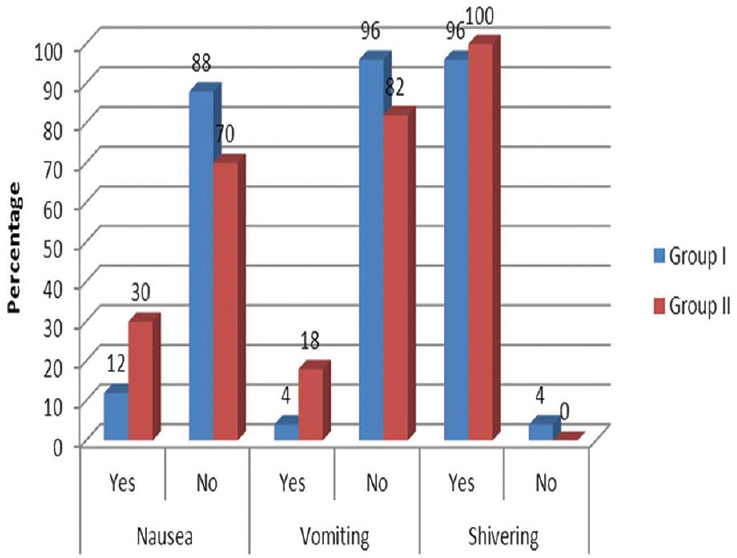 Figure 5: Nausea, vomiting, and shivering in the studied groups. There was no statistically significant difference between the two groups as regards Apgar score at 1 and 5 min and with respect to neonatal intensive care unit admission. Spinal anesthesia is one of the regional techniques commonly used in cesarean section parturients to avoid most of the risks associated with general anesthesia. However, spinal anesthesia carries some risks also: the most common risk is hypotension due to almost complete sympathetic block as the level of block must be at T4 for adequate coverage plus the effect of gravid uterus on the venous return . This study shows that the effect of spinal anesthesia on BP, MBP, and HR was reduced with the use of intravenous 4 mg ondansetron given 5 min before spinal anesthesia in pregnant women subjected to elective cesarean section. Campagna and Cartner  observed that blockade of the 5-HT3 receptor antagonized the Bezold–Jarisch reflex induced by serotonin in anesthetized rats. The results of our study are in agreement with those of a study conducted by Sahoo et al. , who proved that ondansetron attenuated spinal-induced hypotension if given intravenously in cesarean section patients before spinal anesthesia. The use of phenylephrine was significantly more common in patients in the control group compared with the ondansetron group. Also, Rashad and Farmawy  compared between two strong antiemetic medications – namely, ondansetron and granisetron – as regards their effects on BP changes, sensory block, and motor block on spinal anesthesia given to cesarean section parturients as both medications have the same mechanism of action. 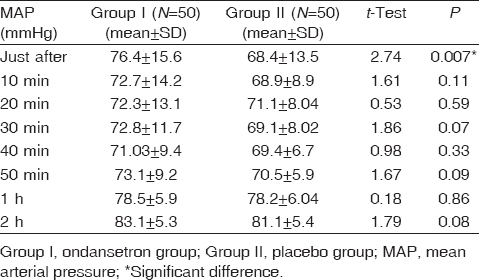 There was significant increase in the use of ephedrine in the placebo group and granisetron group compared with the ondansetron group. It is concluded that in parturient women undergoing elective cesarean section, intravenous 4 mg ondansetron before subarachnoid block significantly decreases both hypotension and the doses of vasopressor used. Our study is in agreement with this. Also, Owczuk et al. found that ondansetron given intravenously attenuates the fall of SBP and MBP but does not have an influence on DBP or HR, which concurs with our results. Meng et al. investigated the dose-dependent effects of ondansetron preloading on maternal SBP, DBP, and mean arterial pressure and neonatal outcomes. They demonstrated that intravenous injection of 4 or 6 mg ondansetron preloading with rapid crystalloid infusion could significantly reduce the incidence of maternal hypotension and nausea and stabilize the maternal hemodynamic. They found that 4 mg of ondansetron preloading was the optimal dose to prevent maternal hypotension, nausea, and other adverse effects during cesarean delivery. This concurs with our results. Khalifa  concluded that prophylactic intravenously use of 1 mg granisetron, 4 mg ondansetron, and 10 mg ephedrine reduced the severity of spinal-induced hypotension, the need for rescue vasopressor, and incidence of nausea. As regards the incidence of nausea and vomiting, ondansetron reduced the number of episodes of nausea and vomiting, as in the study by George et al. and Yazigi et al. .
Shivanand et al. suggested that prophylactic ondansetron 4 mg is more efficacious in preventing postoperative nausea and vomiting in cesarean delivery under spinal anesthesia. Our study is in agreement with this. 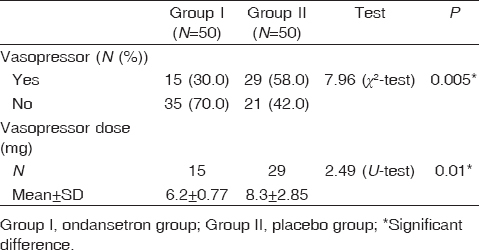 Zahedi and Rouzbeh Kargar  concluded that there was no significant difference between ondansetron and metoclopramide for reducing intraoperative nausea and vomiting during spinal anesthesia for cesarean section. Metoclopramide (20 or 0.2 mg/kg, intravenous) seems to be effective in the prevention of postoperative nausea and vomiting. Because of its short half-life, metoclopramide should be given near the end of surgery to ensure efficacy in the early postoperative period . Atif and Ahmed  found that ondansetron 4 mg is more effective than propofol in preventing emetic symptoms during and after delivery in patients undergoing cesarean section under spinal anesthesia. Moreover, ondansetron reduced the requirement for further rescue antiemetic, which may provide great benefit. Our results are in agreement with this. Ruqaya and Mohamed  revealed that a prespinal ondansetron 8 mg intravenous and preloading with lactated Ringer's solution 10 ml/kg given over 30 min before spinal anesthesia during cesarean section reduced the incidence of postspinal hypotension, bradycardia, nausea, vomiting, and shivering. Another 5-HT3 antagonist, granisetron, at 1 mg was intravenously administered by Eldaba and Amr  and they found that it could reduce bradycardia and hypotension and the need for vasopressors. It is concluded that in parturient women undergoing elective cesarean section, intravenous 4 mg ondansetron significantly decreases hypotension, HR fluctuation, and the dose of vasopressor used. Bucklin BA, Hawkins JL, Anderson JR, Ullrich FA. Obstetric anesthesia workforce survey: twenty-year update. Anesthesiology 2005; 103:645–653. Balki M, Carvalho JC. Intraoperative nausea and vomiting during cesarean section under regional anesthesia. Int J Obstet Anesth 2005; 14:230–241. Campagna JA, Cartner C. Clinical relevance of Bezold–Jarisch reflex. J Am Soc Anesthesiol 2003; 98:1250–1260. Nichols E, Nichols CD. Serotonin receptors. Chem Rev 2008; 108:1614–1641. Lahsaei SM, Amini A, Tabatabei SM, Mehrabani G. A comparison between cetirizine and ondansetron in preventing postoperative nausea and vomiting in adults. J Res Med Sci 2012; 17:760–763. Ruqaya MG, Mohamed AA. The effect of ondansetron on outcome of spinal anaesthesia during caesarean section. Al-Azhar Assuit Med J 2012; 10:222–240. Glosten B. Anesthesia for obstetrics. In: Miller RD, editor. Anesthesia for obstetrics. Philadelphia: Churchill Livingstone; 2000. pp. 2025–68. Sahoo T, SenDasgupta C, Goswami A, Hazra A. Reduction in spinal-induced hypotension with ondansetron in parturients undergoing caesarean section: a double-blind randomised, placebo-controlled study. Int J Obstet Anesth 2012; 21:24–28. Rashad MM, Farmawy MS. Effects of intravenous ondansetron and granisetron on hemodynamic changes and motor and sensory blockade induced by spinal anesthesia in parturients undergoing cesarean section. Egypt J Anaesth 2013; 29:369–374. Owczuk R, Wenski W, Polak-Krzeminska A, Twardowski P, Dylczyk SA, Sawicka W, et al. Ondansetron given intravenously attenuates arterial blood pressure drop due to spinal anesthesia: a double-blind, placebo-controlled study. Reg Anesth Pain Med 2008; 33:332–339. Meng W, Lang Z, Qun W, Ming-Kun S, Yan-Yun Y, Jun-Jing Y, et al. Efficacy of prophylactic intravenous ondansetron on the prevention of hypotension during cesarean delivery: a dose-dependent study. Int J Clin Exp Med 2014; 7:5210–5216. Khalifa OSM. A comparative study of prophylactic intravenous granisetron, ondansetron, and ephedrine in attenuating hypotension and its effect on motor and sensory block in elective cesarean section under spinal anesthesia. Ain Shams J Anesthesiol 2015; 8:166–172. George RB, Allen TK, Habib AS. Serotonin receptor antagonists for the prevention and treatment of pruritus, nausea and vomiting in women undergoing caesarean delivery with intrathecal morphine: a systematic review and meta-analysis. Anesth Analg 2009; 109:174–182. Yegin A, Yilmaz M, Karsli B, Erman M. Analgesic effects of intrathecal neostigmine in perianal surgery. Eur J Anaesthesiol 2003; 20:404–408. Shivanand PT, Vasantha KJ, Ravi R. Efficacy of ondansetron as antiemetic agent in preventing the incidence of PONV in LSCS under subarachnoid block. Int J Res Med Sci 2013; 1:354–358. Zahedi H, Rouzbeh Kargar L. Comparing the prophylaxis effect of ondansetron and metoclopramide against intraoperative nausea and vomiting during spinal anesthesia for caesarean section. J Babol Univ Med Sci 2004; 6:32–36. Ashraf ME, Ashraf MM, Ahmed AM, Noha AA. Challenge of morbid obesity in obstetric anesthesia. Menouf Med J 2015; 28:308–314. Atif AG, Ahmed M. Evaluation of ondansetron and low dose propofol for control of emetic symptoms during cesarean delivery with spinal anesthesia. Med J Cairo Univ 2005; 918:921–973. Eldaba AA, AmrYM. Intravenous granisetron attenuates hypotension during spinal anesthesia in caesarean delivery: a double-blind prospective randomised controlled study. J Anaesthesiol Clin Pharmacol 2015; 31:329–332.